The burger busting adventure began with taking Happy Meal to the LACMA only to discover that the children’s museum was closed. Living in a cash strapped state is not always awesome. They gave us a free pass to the other museums, but it was a fool’s errand. Rodin, Rauschenberg, Hockney, Pollock, and Japanese netsuke collections simply failed to get anything more than a lukewarm response out of a 7-year old. Off to The Golden State for a burger. The thrill of driving down Fairfax and seeking parking on a Saturday around noon was that one discovered how well everyone else’s horn works, and then one had the opportunity to show others their middle finger. We ordered 2 The Burgers Med Rare and with nothing on them but the aged Cheddar. We ordered at the register and then seated ourselves. I found the tip line on the receipt curious considering that no service had yet been rendered. After about 10 minutes, two picture perfect burgers showed up at our table. Just a tiny hint (not quite enough) of beef funk, the seasoning was spot on, and the burgers were juicy. I never once felt the need for salt or mustard. 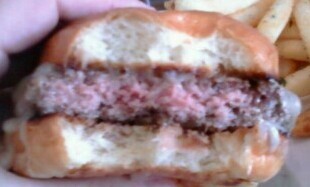 Meat : Bun ratio was skewed slightly in favor of the brioche. This was almost exactly the same as the bun that the WORLD’S BEST BURGER came on at Olives in Vegas. The burger at The Golden State was 1.5 ounces lighter, so the ratio was a little off when judged against the Olives Burger. While the grind was a little fine, the meat was perfectly pattied and not over-manipulated, so the mouth feel was crumbly rather than mealy. This burger flirted with greatness—at a 10 dollar price point, it is the current king of the second tier of burgerdom. Dry aged beef in lieu of wet aged beef and a slightly larger portion would push this burger from tier two to tier one, and it would also bump up the price. It was probably priced just right for its Fairfax location and target market. The fries were just plain great—standard cut and nice and crispy—well-seasoned. • Grilled not griddled-HUGE difference..griddling is better. • Blend--rib meat and chuck with wet-aged, rib fat cut back in. • Grind—fine, but this worked out for this burger. • The staff—burger geeks just like the guys at Umami—it’s always a treat to geek out over niche food with those skilled in the art. • The aoli—it’s like tarragon flavored tartar sauce—keep it away from your burger. • Curry ketchup---ketchup in general doesn’t belong on the burger. Burger Review -- Close to being a truly marvelous burger..prepared with care and skill but just short of the mark.